Microlab Solo5c High Fidelity Bookshelf Speakers. 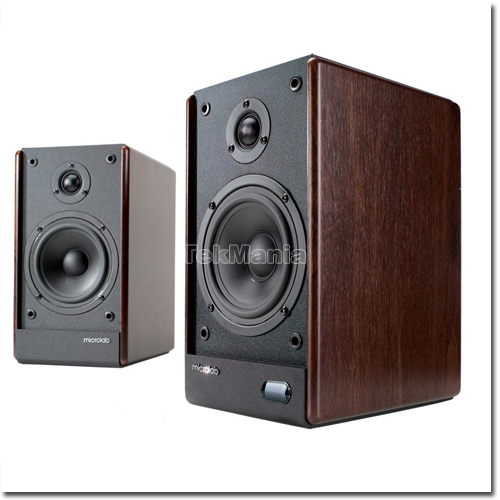 High fidelity bookshelf stereo speakers with a beautiful wood finish. Designed with Microlab special care and audio expertise, this series is ideal for most living room setups. Listen to crystal clear and dynamic music with this stereo pair and witness the quality in its audio drivers. High resolution and near perfect performances, simply stunning audio production quality. Comes with infrared remote control capability for wireless control. Special heritage range for Microlab's 2.0 system that employs high quality design techniques and speaker technology - perfect sound quality and near linear response Incorporates IGBT OCL circuit for pure tones and dynamic acoustic production. Wireless remote control for attenuation. High quality sound and full range spectrum, ideal for all music lovers and audiophiles.